Easter is on the way! It’s a holiday we celebrate with our friends and family, including our furry family members. Some of our cats even like to get in on the fun. Hopefully, the Easter Bunny will visiting your feline with a load of Easter basket stuffers this year, too! Here are 25 pictures of Easter cats and kittens who are ready to hunt for eggs, open their baskets of presents, and pose with their bunny friends! They look like they’re having so much fun! It’s great to see so many kitties enjoying the holiday. If your cat is joining in on your celebration this year, remember to follow a few safety tips to keep your feline happy and healthy. 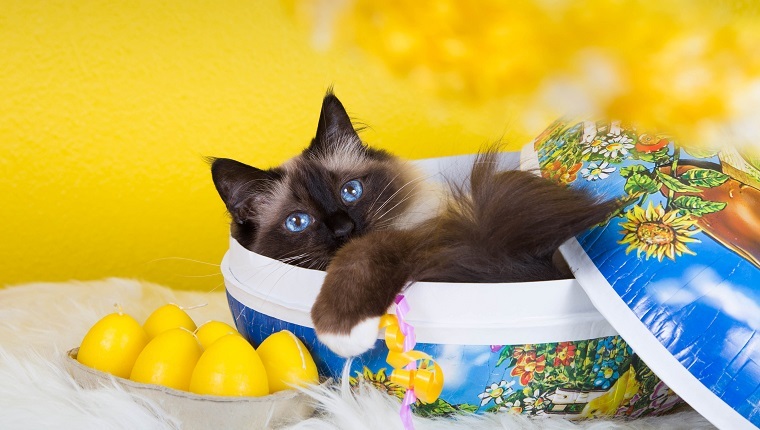 CatTime has an in-depth Easter safety guide for keeping your cat out of danger this holiday. If your cat eats or drinks something toxic, you should contact your emergency vet or Animal Poison Control, which you can reach at (888) 426-4435. You may be charged for the call, but it’s worth it if you can save your cat’s life. Keep chocolates and candy out of your cat’s reach. Alcohol and caffeine are toxic for cats, so cover any drinks and keep your cat away. Cooked bones are dangerous. Don’t leave them where your cat can get them after the feast. Guests can cause anxiety. If your cat is anxious, put them in a safe, comfortable room of the house away from guests. Keep the trash secure. There can be a lot of dangerous things in the trash for cats. Don’t let food out of sight. Several human foods, like grapes and raisins, are toxic to cats. Small toys, plastic eggs, and plastic grass are dangerous for cats. Make sure kids put them away when they’re done playing. Easter lilies are toxic for cats. Keep these flowers out of your home. Is your cat going to participate in your celebration? We’d love to see your kitty’s Easter pictures in the comments below!